Bike49, an organization that is on a bike tour that hits the 49 continental states of the United States, will be hitting the Prairie Spirit Trail soon. After a trip through a recent snowstorm on the Katy Trail in Missouri, they are recovering in Kansas City. Look for them to head out soon and hit Lawrence from where they will turn south. If you see them along the way, give’em a chat and maybe a power bar. 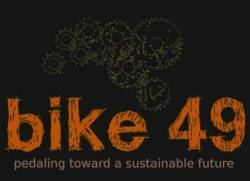 Bike49 is an organization that promotes cycling by visiting schools and preforming community outreach. You can learn more about them at their website linked below.